Fresh from penning a cracking article about Wilson Chandler for Niubball, Edward Bothfeld swings by to talk playoff runs, how to stay true to the CBA but still get paid in the NBA, Guangsha’s malaise, All-Star selections and the best and worst jerseys in the league. AC: First question, on a scale of 1 to 10, how stressed as a Guangsha fan are you right now? AC: I’m guessing its still the same problem- an over reliance on Wilson Chandler, or do you think there is an even deeper problem going on? EB: Its the reliance on Chandler and Ramos. Coach Cleamons said at the press conference that on defense, teams are putting a lot guys on Chandler, which is why he is settling for a lot of outside shots. Basically, they haven’t been able to get into a rhythm. If some of the supporting cast could hit some threes, they would be set but Lin Chih-Chieh has really struggled shooting lately and Jin Lipeng can only play a few minutes a night so there’s nothing to take the pressure off of PJ and Wilson, who I think is ready to head home and get back to the Nuggets. Danilo Gallinari, who Chandler would compete for minutes with, is injured so there are a lot of game time available for Wilson right now. AC: Yeah, the Gallinari injury has been a nightmare for my fantasy team but in real terms, Chandler is suddenly a lot more important for Denver. What sort of fall-out do you think there could be if Guangsha fail to make the playoffs or sneak in but then don’t play very well? EB: Well, Chandler won’t be back next year and I doubt Cleamons will be either. I think PJ is signed for next season but Guangsha needs some national team players as well as some good imports in order to really make some noise, so if the season ends poorly, there will be a lot of turnover. If I were the GM, I would keep Lin around as well as Wang Zirui, who is the youngest player in the league at eighteen but has earned more minutes as the season has gone along. AC: Its been a crazy season so far- previously mighty teams like Jiangsu and Bayi have struggled, Xinjiang blew the roster up but are coming back strong and Fujian and Shanghai are still in the playoff mix- do you think we could see any more shocks in the next three games? EB: The only consistent thing about the CBA right now is Guangdong. It will be interesting to see how the NBA-bound guys play in these last rounds. The Guandong-Xinjiang game will be interesting, although I guess almost every remaining game has playoff ramifications so it’s time to see who’s for real and who isn’t. AC: The CBA is probably delighted right now- they couldn’t have asked for a more dramatic ending to the regular season. As for the NBA-bound players, I can safely say that Smith is still going hard having seen him do his thing on Wednesday against Shanghai but if I was his agent, I would be going crazy right now- JR’s chasing a multi-million dollar contract and the last thing any normal person would be doing is trying to drive to the basket in heavy traffic or fighting for rebounds with 6″11 forwards. You have to give Smith credit, he’s still going for the win every game despite his itchy feet. EB: It’s refreshing to see that though. Guys like Smith, Chandler and Brooks are playing for NBA contracts that will most likely set them up financially for life. If I were in their shoes, it would be difficult to know what to do; wouldn’t they feel foolish if one of them suffered a serious injury in one of the last games? Its tricky; there’s something to be said for honoring your CBA contract, but at some point you have to be practical and whether you like it or not, money is an important aspect of life. AC: Indeed. Looking at Shanghai for a second, they are in seventh place right now. Do you think they’ll still be there after games against Jiangsu, Beijing and Tianjin. First and foremost, I desperately want them to make the playoffs but a lot of people have talked about finishing seventh and getting a Shanghai-Beijing series, which could be massive. AC: Yeah, an old timers vs. new money derby in the playoffs would be epic, especially after the complete mayhem of the Ducks’ last visit to the Yuanshen. Basically, I just want them to get to the postseason but facing Beijing would make it even sweeter. I’m guessing you saw the All-Star line-ups? Any thoughts? EB: Well, J.R. Smith is a fan favorite and Marbury was always going to be a safe bet but generally speaking, I don’t put too much into All-Star games. That said, the jerseys are awesome. AC: Yeah, I will be interested to see who makes the bench- I didn’t think any of the Sharks who got nominated (Liu Wei, Zhang Zhaoxu, Mike Harris) would make the starting line-up but the Chinese pair might slip onto the bench. Is there anyone from Guangsha you think might make the final cut- I’m guessing Chandler is going to be the other overseas player for the South but will anyone else from the Lions creep in? AC: Perhaps, no chance for Jin or Lin? EB: Jin is a fan favorite but only plays 18 minutes a night and sometimes doesn’t have any energy at all- it would be different if Guangsha were at the top of the standings but they aren’t, so I don’t necessarily think they deserve to have a bunch of All-Stars. AC: Alright, last question; we touched upon the awesome All Star jerseys- aside from your team, whose got the best jerseys in the CBA? EB: I have always liked Zhejiang jerseys– that might be because I’m a Bulls fan back in the States though and they are the Golden Bulls here.I look forward to seeing them live in Hangzhou tonight! AC: Yeah, I like Zhejiang too but for different reasons ie. the preposterously bright colours. I also like the Fujian Sturgeons jersey but more for the improbable animal that they blaze across the chests. Bayi’s are pretty sweet too– its simple but effective. I would say that Tianjin’s are the worst though. Like the team itself, not very eye-catching and lacking ideas. EB: If I remember correctly I think Qingdao’s were pretty bland. AC: I don’t know, I can roll with a bit of Qingdao but that’s just my conservative British tastes coming through. Anyways, I think that’s us done. thanks for your time, man. AC: For sure. 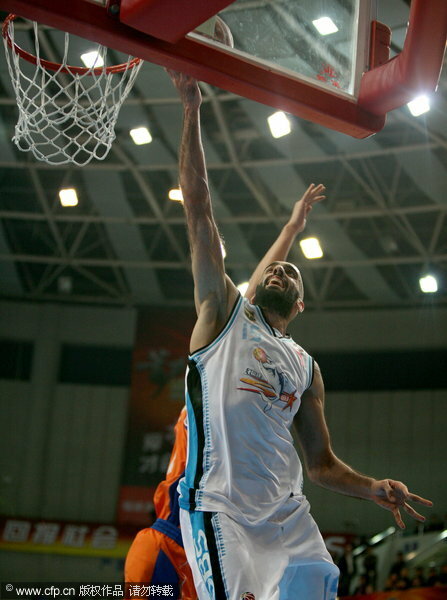 Do you have a prediction for tonight’s Guangsha game? EB: I think either we win in a tight one or Zhejiang wins by 10. AC: Well, good luck all the same. We stumbled over here from a different website and thought I should check things out. I like what I see so now i am following you. Look forward to checking out your web page again….